Closes Noon, GMT, Friday 21st October. A lucky Winner will receive a $10 voucher to the Polkadoodles Digi Store. Before we get to the inspiration make sure you check out our Facebook group this weekend - we have some great prizes, competitions and also a new launch going on so don't miss out on all the fun! Helen - We've gone all Autumnal for our new challenge, so Serenity Fairy Kisses sprang to mind from the Serenity Collection. I just love fairies and Serenity is just so devine. For some reason had to give her green hair well she is an Autumn fairy today. 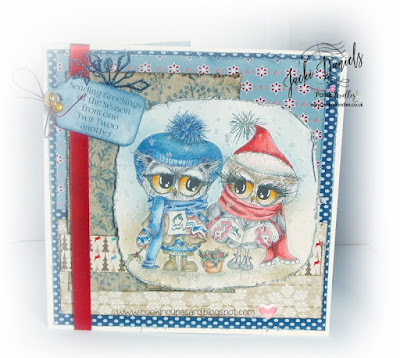 Pauline - I have used one of my favourite collections, the fabulous Winnie in Wonderland, for my card. I've been fussy cutting again - I have used a gorgeous topper, some fabulous papers and lots of bits and pieces from the Embellies and Ephemera sections. 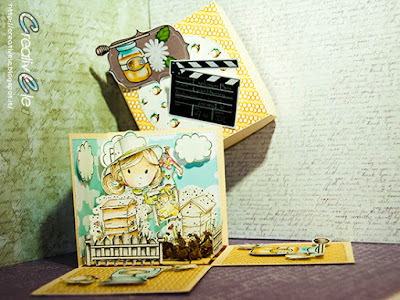 Lisa - My card today uses the Sticks & Bones Mammoth Dinosaur Download Bundle. 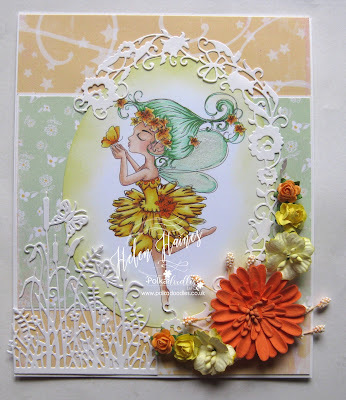 I've coloured up one of the cute images, with alcohol markers and layered her up with some of the fabulous papers and embellishments. Jacki - For my card this week I have used papers fromWork and Play festive hollybobs collection and the image and sentiment are from Twiggy and Toots download collection I coloured the image with my Pablo pencils, added some glitter snowflakes and jingle bells for a merry chrimbo card. 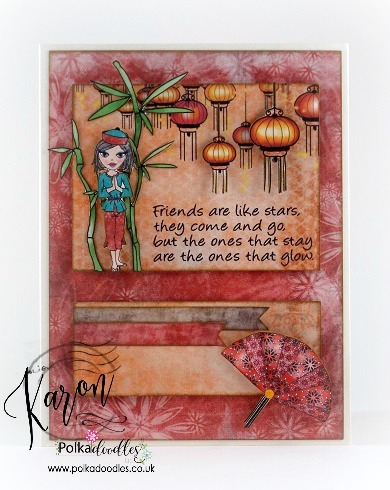 Karon - I have the wonderful Dollie Daydream Goes East Collection for my card this week. I love the papers in this collection. I have faux paper pieced the clothes in the little image, the rest was coloured with Lyra Pencils. Added some depth by using some foam dots. Carol - I have had so much fun with the Festive Christmas Collection, I decided to use it again this week for our Autumn Colours challenge. I just love all the digital elements in these collections and I used them to make a really quick and easy card today. 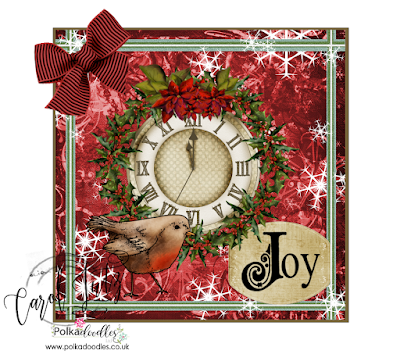 I arranged the little robin and clock digital soup element on top of a paper from Octavia Frosted Winter collection, added a tag, sentiment and a bow - then printed it all out and layered it onto a backing card - so quick and easy, just what you sometimes need for a Christmas card. Elena - Hi there Polkadoodlers. I like to you use the honey in the fall, especially when the cold becomes strong. Here's my creative inspiration for this theme, "good honey" produced by HONEY PIE. For part of the project I used printable digital stamps to the collection WINNIE FRUIT PUNCH BIG BUNDLE. Also the PUNCH PAPER HEAVEN 3 and PUNCH PAPER HEAVEN 1.